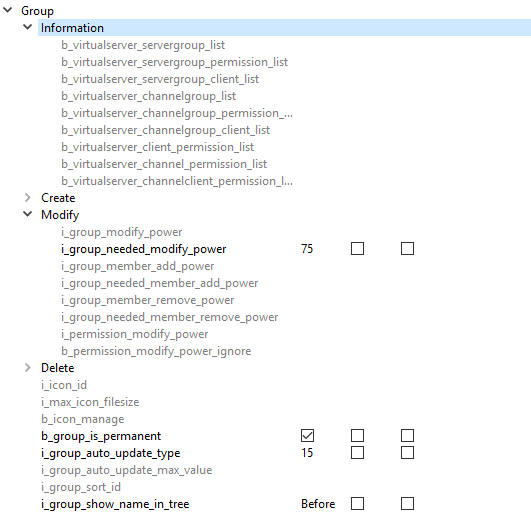 Why should Guest have a i_group_member_add_power or i_group_member_remove_power? Remove both permissions + Grant! from Guest group. You don't want that your Guest can do things with groups. In case they should be able to add or remove users from a groups, then your target groups where they should not be allowed to do needs higher values in their own i_group_needed_member_add_power , i_group_needed_member_remove_power. Setting the same value in "Add Power" and "Needed Add Power" in the same group is a bit nonsense if you do not plan that user in the group cann add more users to this group. What is the needed member add power of your Normal group and which Member add power do your channel groups have? Raise the the i_group_needed_member_add_power of the Normal group in case the needed memner add power is same or lower as any channel group's i_group_member_add_power. i discovered, that users can set their server group, depite not beeing allowed to view the permissions of this group. to be more specific: i have many groups with the exact same permissions (well, every group with other priviliges are mod or admin groups). the only difference is the name of the group. a user of this group can now add himself to every other group (which has the same permissions). This is not what i want. I want that a user of this group has no influence on anything regarding groups. Anyone can set that group anytime because there is no i_group_needed_member_add_power set in that group. See post #2 for more details. Yes, that's the case for nearly all permissions beginning with i_. I am setting up a Server Group and i give access to that group Assign and Remove members with Voice access. But that Server Group can give Channel Admin to everyone. How can give that Server Group access to give some other Server Groups without acess to chose Channel Admins ? That's only possible when server group's value for i_group_member_add_power is lower than channel group's i_group_needed_member_add_power. Now the ranks above are for ingame which are Staff and the ranks that have TS permissions are the SA's and GA's. Now I want a Channel Admin (Channel Group) to be able to give other players the Channel Admin rank including the staff for their channels with out being able to add/remove clients Server Groups how can i do so? Just set Channel Admin's i_group_member_add_power to a value which s lower than the lowest i_group_needed_member_add_power in your server groups. Do the same thing with the i_group_member_remove_power and you have what you did request. So i have been able to get Guest to not give normal but they are able to take normal away from other users?! Is that the same for my question? Please read Restrict to remove target group(s): from post 1 or my post above. Yes the all content in post 56 is for you.